Makeup and beauty !!! : My first Simple Make up tutorial ! My first Simple Make up tutorial ! Well,This is the makeup that i did in my Son's Birthday ! Oriflame studio artist Concealer illuma flair in Shade light. Maybelline BB cream in shade Natural. Vov Eye-shadow (from the kit i won from Vish's Giveaway ). Avon Eye pencil In shade Twilight. 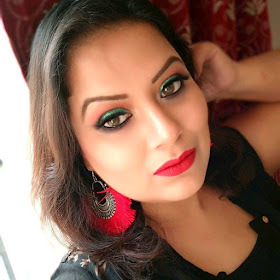 Lakme 3-1 Aqua shine lipstick in Shade Fig. I first applied the concealer to cover up my dark circles,pimple spot and some blemishes.Trust me in mirror it was not so horrible but i took the picture from very near just to show you the step ! Followed by Keyaseth Umbrella Powder. Now firstly i cover the eye lids area with the no.1 eye shadow that i pointed in the picture. See how my eyes look now. Then at the lashline i applied eyeshadow no.2 (pointed in the picture above) and now see my eye picture. I want to prominent my eyes so i go for avon eye pencil in Twilight shade for my upper and lower eye line. Next i applied Lakme mascara for my upper and lower eye lashes. And lastly applied Lakme lip color in Shade fig. And finally My Look ! So here comes the end of my post..
Feel free to post your reviews below ...! Thanking you for stopping by. OMG its simply superb...keep doing more...love the way u did. i love ur look dear..v pretty ..
thanks Amee ! this is my first tut was very nervous ! but i think it works ! very nice Samannitadi...Lovely lady..Thanks for the tutorial. U r looking so preety..love the way you did it.. I have seen some advertises about keyaseth's product on my local tv channel(oriya channel)..are they really good? plz reply...m planning to buy a bb cream..
hi Snigdha firstly thanks for your such a lovely comment. Now coming to your enquiry...yes i found some products of Keyaseth is really good,Specially the makeup range suits me really good. Very nice.. Thanks for this great makeup tutorial! Wow really awesome .. Thanks for sharing this great makeup tutorial!